Project planning helps, always! Without planning a project, you may end up shooting in the dark or may fly or die with your own luck. But no matter how much you plan, there is always a possibility of situations that would just pop up and will turn your project status into Red from Green. These situation occurs when a project risk is realized. Welcome the world of Project Risk Management for a project manager. Project risk is always considered to happen in future, something that cannot be predicted. So is it not possible to have uniform policies or standards to deal with situations when risks are realized? 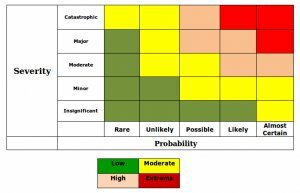 This is what we would like to discuss in this project management guide to risk management. This series about project risk management will form a basis of understanding for beginner as well as pros to get started with risk management. Let’s look at these step by step project risk management guide articles linked below. Let’s look at some of the project risk examples and I hope the articles linked above will help you understand, highlight, respond to implied project risks. Also it is important to understand that project manager can no longer rely on conventional spreadsheet based risk management practice. If project manager wants to get his team involved to manage project risks, spreadsheet based approach is certainly not collaborative but it increases the chances of making risk register dormant. It is strongly suggested to start using online project risk management software to track, manage risks better, notify team members about it, have conversation, comments, link those risks to project schedule and establish traceability between project risks, schedule, resources and projects.